Quite a long way to go for such a short visit, but I hadn’t wanted to miss (again) the opportunity to ride behind a large steam loco through the streets of Brno. This year’s trip was to be from Bratislava but sadly it got cancelled long after I’d booked my flights. That left me with the choice of throwing the flights away (which would have been a lot cheaper) or two days trackbashing instead of one and the steam trip. Obviously I did what any self respecting crank would do, and went for the second day’s trackbashing. A reasonably civilised start on the 08:08 LM stopper to Wolves, hopefully for 08:41 XC forward to Birmingham Irrational. It wasn’t to be; 08:41 was 7 late so I opted for 08:45 Bendyleano which naturally was overtaken at New Street by the XC. No problem though, I had plenty of time and after collecting pre-ordered WebDosh from Travelex I was still left with a 75 minute fester. Ryanair then caught me out by trying (unsuccessfully) to go early and calling the 11:15 flight at 10:35. I decided to prepare myself for the fray beforehand so ended up well down the queue. This made no difference in the anarchic shambles of a packed Ryanair flight and I ended up in 5C which I’d have chosen anyway, if able! RA in good form. Took off at 11:31, put the seatbelt signs on about an hour into the flight for no apparent reason. Consequently when the 10 minute warning arrived many punters were hopping up and down wanting to use the toilets and were told no. Preparation stood me in good stead! More or less on time at BTS; took a while to wedge the bus for its 30 second journey but I was well placed and was through immigration and ticketed up in time to get the 93 bus at 14:58, off a 14:40-ish arrival. And so to the Airport Hotel Chopin which took a little finding with the help of a young lady in a furniture shop – very halting German just sufficed, bless ‘er. Brand new hotel, air con, 6:30 breakfast, €40 special offer (HRS) price. Brilliant. After a breather, off on a 61 to hlavná stanica for a fight with a ticket machine which deprived me of 65 cents (my own fault entirely) and a wait, with Kozel, at the nearby caff for the 18:15 stopper to Pezinok. The stand-up bars at B-hl.st. had caused some amusement among friends before my visit as Google translated them as ‘knee-trembler’. Undeterred, I took advantage of the one on N3 for a takeaway ½ litre of Topvar at €1.00. A civilised, and by station refreshment standards economical facility. The train to Pezinok is a grubby 240 087 and three even grubbier, graffiti’d second opens. Not a particularly good advertisement for ZSSK. EC344 Beograd-B-hl.st. (18:01)-Praha is being announced 30 late – hope we’re not held for it or the evening is wasted track-wise. So far so good – EC344 was ignored and the Os left on time, remaining so all the way to Pezinok where R720 was on the screen and a pleasant ticket lady sold me the required ticket. Compare and contrast to Praha-Libeň on 6.7.09! R720 turned up just two minutes late (and hauled by Goggle 750 150 to my surprise) so there was plenty of light for the diveunder line and on to B-Predmestie though it was starting to go dark after B-Nové Mesto. Lucked on to a 93 to Zochova and managed to find the Bernard pub fairly easily – trying to find out if they did an unfiltered version was more tricky. As far as I could gather from a helpful local with only slightly more English than my Slovak, all the Bernard beers are unpasteurised so I settled for the very pleasant 11° at €0.93, I suspect a very good price for an Old Town pub. And so via a long and in places slightly scary walk (well, tram for one stop since one happened along), to the strangely named Omama Shop Café which belies its name by being an excellent and very pubby pub. It’s got a lot of breweriana on the walls, and the unfiltered light beer from Minipivovar Richtár was a revelation for Slovakia. Well done kamnapivo.sk ! Still in Arriva mode, I’d elected for safe connections to get me to Petržalka for 06:39. This required the 05:33 no 61 from Galvaniho. I opted for the short stagger along the roadside instead of the long official one through the Avion Shopping Centre, consequently had just crossed the road at 05:12 when I heard a bus. The driver waited for me. Again. And so to hlavná stanica where the connection made much better and consequently the 93 dropped me at Petržalka at around 05:43. Sigh. At least there was plenty of time to get a coffee and finish yesterday’s notes. Haulage for R720 was another Goggle, 750 164 and stock was slightly refurbished (new seats) compartments. The lady gripper clearly had no idea what my Interrail was, but gave up in the end and went out of her way to make sure I knew where I was when we reached Pezinok, slightly early. The return to Bratislava was a 363 with four fairly grim open seconds. Usual breakfast plus fresh fruit and cake at the Chopin followed by a welcome shower. Back to the station after a stocking-up visit to Hypernova – nice lady on the till but so, so slow. I had to run for the 61 again. Efforts at hlavná to get an Interrail leaflet to wave at the grippers foundered on language problems [I put my thinking cap on after that and found the relevant passage in the timetable book which explained what an Interrail was] but efforts to get a carry out Corgoň from N3 succeeded. Train was 750 058, one air con with toilet but no air con [I wronged them, it worked eventually], one old ‘un, and one air con with air con but no toilet. Still, much better than the anticipated (with dread) wheelie bin. Rather more scary gripperette this time, equally bewildered by Interrail but insistent that my (and everybody else’s) rucksack went on the rack despite the train being nearly empty. At least she was pleasant about it. 812 050 and trailers passed us at Nové Košariská heading for Bratislava so maybe I had a lucky escape with the Goggle. 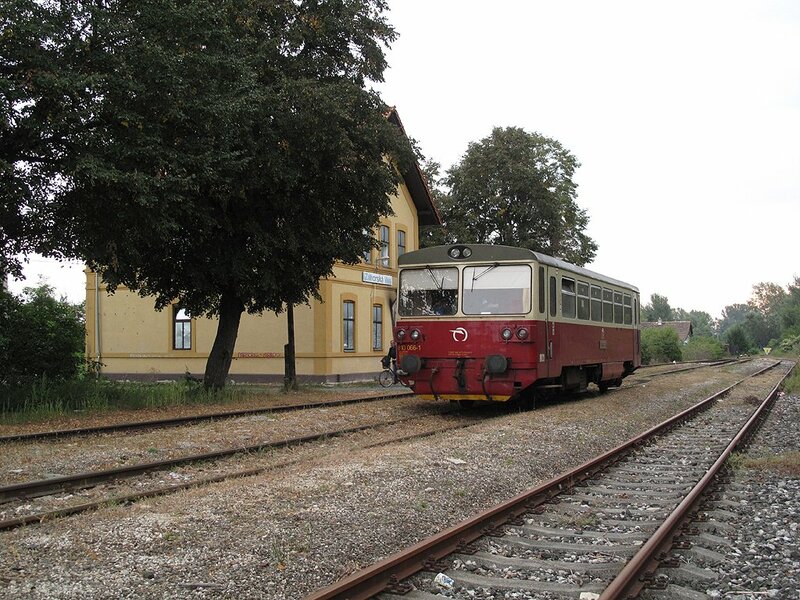 Also 812 047 and two trailers at Dunajská Streda – and the air con’s working too, so pretty good so far! It’s a real, real trudge to Komárno, flat as far as the eye can see for the whole 2½ hours. Back to reality on arrival, with 240 098 heading an assortment of old vinyl seated rubbish to Nové Zámky. NZ is, um, a bit unreconstructed in the station area, right down to the Škoda taxi with no wheeltrims and one black wing on a blue car. To be fair most of the others were a bit more up to date. Lunch was taken in the buffet, it being a Sunday, seemed a useful opportunity. Goulash, featuring two pieces of meat, dumplings and Corgoň. Still it only cost three quid even at today’s rotten rates [typing this up a week later, they’re even more rotten]. I got my come-uppance for the morning’s good luck at last, with 810 491 and a trailer to Zlaté Moravce. 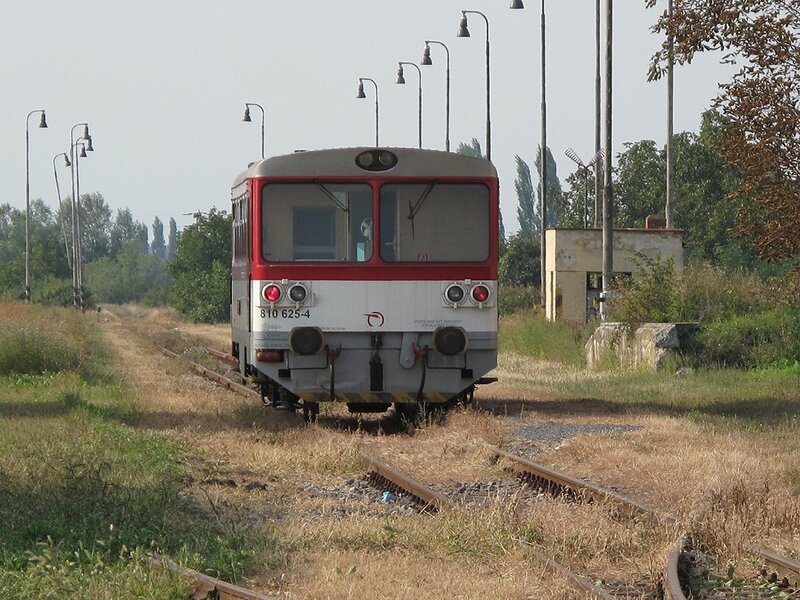 This line is the only passenger service to Zlaté Moravce now (and a very sparse one) with JR141 having lost its trains. The line to Zbehy appears still to be in use and there were two loaded timber wagons, a rake of covered wagons and assorted brake vans at Zlaté Moravce. The passenger train was reasonably busy though it didn’t require the trailer which was left at Zlaté Moravce, presumably for the Monday ‘rush hour’ 05:14 ! Scenery-wise, there isn’t any although hills do appear in the distance as you approach Zlaté Moravce. Back on the ‘bin to Úľany nad Žitavou and thence by a Sunday-night-wedged R834 behind a 242 to Šaľa to do the noth side of the rather large Nové Zámky – Šurany – Palárikovo triangle. Track done, it’s beer hunting time so back to Nové Zámky on R873 behind 263 009 with a view to the connection to Šurany. A bit of haste required for the connection as I couldn’t work out which train it was; but it turned out to be the one with the Goggle, 750 110 (Os5059). Failed miserably with Minipivovar Šurany – the pub at the appropriate point had a notice on the door saying it was open on Sunday 17:00-23:00 but at 19:15 it was firmly shut. [This wasn't in fact the brewpub; a better researched later visit was successful]. Retired hurt to the Zlatý Bažant pub by the station, a friendly establishment with pictures of Castles, Halls, pannier tanks, Merchant Navies, Midland 4-4-0s, Exeter St. David’s, a West Country (‘Appledore’ from memory) ... not quite what I expected in Šurany. Completely uneventful journey back to the hotel on a quite reasonably unwedged R1530 (3 in an 8 seat vinyl compartment) which was on time, and the inevitable no. 61. It had obviously rained quite a lot earlier and (of course) started again as I walked up from the bus stop. A round of applause for the Poundland umbrella! Stupid o’clock start again, resulting in me catching an earlier bus than intended again (05:25 vs 05:42). Plenty of people around but virtually no fodder at Hlavná stanica beyond some fly-blown fricadelles and the like, singularly unappetising. The café upstairs doesn’t open until 07:45 which seems like a good opportunity not to make any money! First of the day was 263 007 with assorted vinyl seats on 06:32 to Kúty (Os 2004). I left this at Zohor where the decision to get up early and return on the one through working was fully justified, the physical junction being south of the station. A pleasant little trundle to Záhorská Ves compared with yesterday, with the ground rising oh, several feet here and there. When all’s said and done it’s still flood plain though. Záhorská Ves is on the river Morava and has substantial flood defences. And a Co-op and a post office which were open at 07:50, and a pub and a chemist which weren’t. I tried hard to be a muppet by convincing myself the train went back at 08:27 but fortunately checked after I’d been walking for 10 minutes or so. In time to get back for the 08:12 to Bratislava. It’s raining and the next train’s at 15:34 ... Around 10 pax on the outward journey of whom 6 left at Vysoká pri Morave. 17 back, so 810 066 coped easily. The three legged dog opted not to travel. Another 15 joined at Vysoká on the way back, and one at Vysoká pri Morave zastávka. Audi drivers are the same everywhere it seems, with one trying to run the level crossing in front of us. He thought better of it, but not before 066’s driver had to stick the brake in. 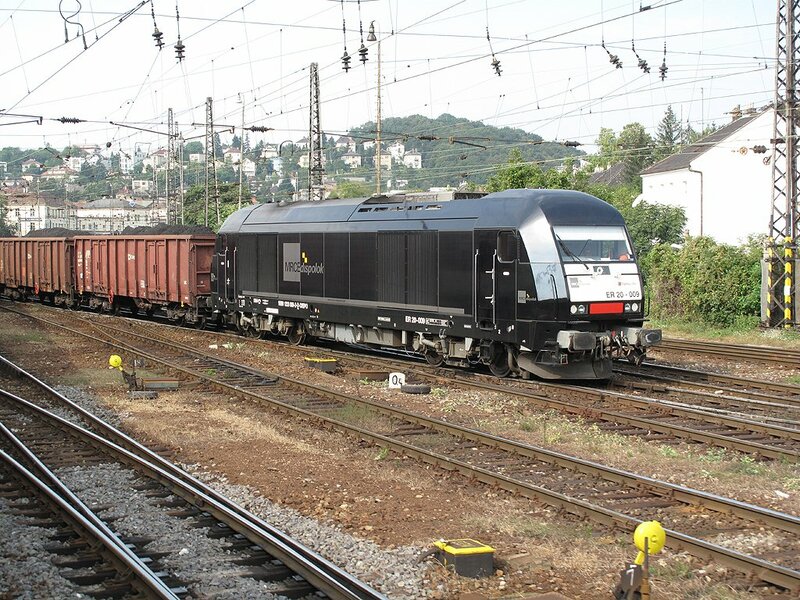 Slight alarm at Zohor on the return – the branch train is booked to wait 8 minutes for Ex131 Bohumín-Bratislava to pass. This was late and delayed us for 6 minutes. As I wanted the the connection more than the side trip to Břeclav I’d decided on the man of steel approach since I could still get 11:01 from Devinska Nová Ves (or Bratislava) and make my connection. In the event I had 5 of my 11 minutes left at DNV which I used to good effect in visiting the immaculate free gent’s! Before arriving at DNV a 711 hauled freight was noted crossing over on the Stupava branch; it arrived at DNV just after I did. 263 007 was powering the Stúrovo-Kúty stopper with more vinyl seated rubbish in tow (must have nipped back to Bratislava quite smartish). This one waited for a booked 6 minutes at Veľké Leváre for Ex276 Bratislava-Praha to pass but that was on time, so no delay for us. Faint heart won the day at Kúty – why risk all on a 10 minute connection from the side trip to Břeclav? Don’t need the track so I decided to stay with the 2-hour fester at Kúty. Walked into ‘town’ – took half an hour each way, so >3 miles there and back. Nothing there as far as I went (just past the church, obviously!) apart from a couple of shops. 5 minutes or so from the station (left outside, then right where it says ‘Centrum’) is a Pizzeria with a Bernard sign on the wall. Shut at 10:30, not surprisingly, and no opening hours visible. Stopped at a potraviny on the way back for bread, cheese and beer – felt a bit faint further on so I downed one of the beers while having a sit down! Back at the station there was still half an hour so it was off to the buff for a restorative Corgoň. My third visit to this establishment which is in danger of becoming One of Those Places. However Trnava is the last route for me from Kúty so that should be that. 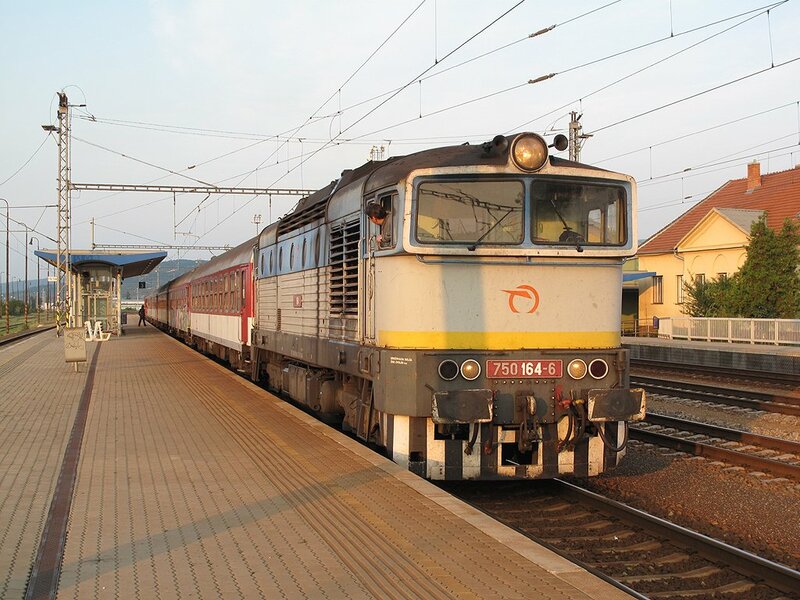 The Trnava train turned out to be a pleasant surprise, being 240 130 and two ‘suburban’ coaches with the two lowered sets of doors, the first time I can recall encountering these on ZSSK. Major invasion of OAPs at Šaštín-Stráže with all seats suddenly taken. It appeared to be some sort of outing. At the time of writing (Buková) they’re still all here, physically at least. Scenery has taken a major turn for the more interesting as we’ve progressed, with hills and tres and all that sort of stuff. Even a tunnel at one point. The branch at Jablonice (table 117) looked shiny and well maintained for the short distance I could see. By Šelpice we’re heading for flat again – maybe that’s my excitement for the day. 36 minutes at Trnava if we’re on time (we are currently) so another instalment of lunch may be called for. The OAPs stayed aboard to Trnava, where the 14:06 to Galanta was also wedged, this time with schoolies. Loco hauled again, and went from the ‘main line’ side of N2 which was a civilised gesture, I felt. Mass exodus of schoolies (college I think in fact) at Sereď which left room for the rest of us. Haulage was 240 125 and arrival at Galanta was on k2. Connection on to Šaľa was the ubiquitous 263 007. Another schoolex but on a smaller scale so I had a bay to myself. The Neded branch train was a wheelie bin, naturally (810 625, for the record). It’s back in the heart of cornflake country so if you’re not interested in corn it’s pretty dull. Around 4 pax lasted until the end where there’s a factory which was rail served. Track is still in place but there’s clearly no traffic. There is however, the pub at the end of the Universe, an extraordinary little shack opposite the factory gate, dispensing Staropramen and Braník. There’s a covered outdoor drinking area (fortunately, there being no indoor one). I got quite a lot of change from my euro – I think the beer was €0.70. Difficult to follow that, really. 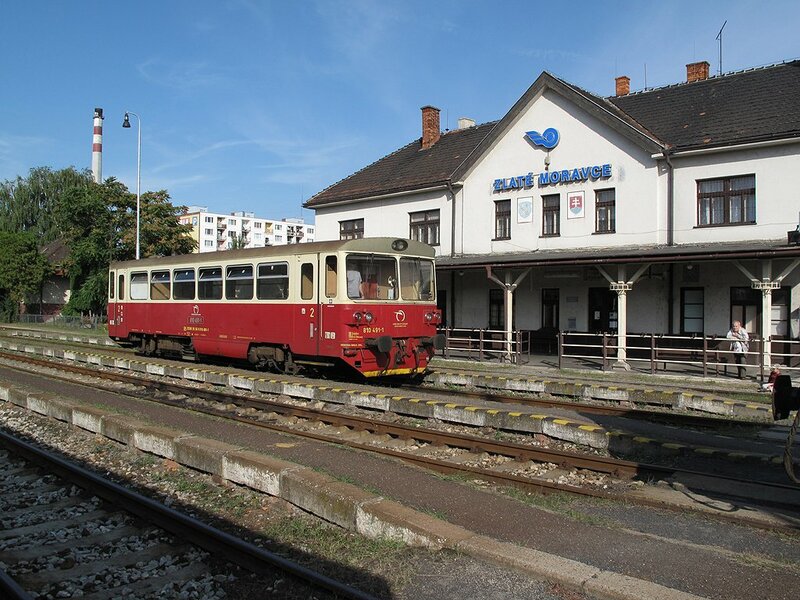 I returned to Šaľa on the ‘bin and had two options; either carry on to Bratislava on a stopper (7 minute connection, arriving 18:27) or wait in the Bistro Vila across the road for the Rýchlik at 17:55, arriving 18:40. No contest – yet more Corgoň. You can watch the trains from the outside terrazzo with its luxury ashtrays made from rusting tins. One (freight, not ashtray) was a curious combination of 240 and Grumpy hauling a long freight with an ex-works coach in the middle of it. The ‘R’ was thoroughly scruffy – 242 247 and an assortment of run down stock. But it’s only 45 minutes. Rough ride doesn’t begin to describe it. I gave up trying to write. We got (almost) to Bratislava in one piece, ending up in N6, the ‘excursion’ platform continuing from N1 just outside the station. I was sitting on the right hand side of the train and when I looked out of the window it appeared we were waiting for a platform so I sat tight not realising there was a platform the other side. The lady gripper arrived and explained the error of my ways, luckily. Off by tram 13 to 1 Slovak Pub which is a pleasant enough, vaguely beer-hal-y environment.Beer was limted to Zlatý Bažant, Krušovice and ‘our own home made beer’ which the waitress said was brewed in the Czech Republic. She recommended the Zlatý Bažant. Draw your own conclusions. The food was dreadful, though as the whole thing came to €7.07.you can’t really complain. This, and extreme fatigue, dispirited me enough to head for bed, so it was tram 5 and the perennial 61 back to the hotel. 810 625 looking a little forlorn at Neded on 14.9.09. The branch lingered on until bustitution from 12.12.2010 and official closure from 10.12.2011. Breakfast only just starting to appear at 06:30, the only fault in an otherwise excellent hotel. The cooked part still hadn’t appeared when I left at 06:50 but enough was there for me to make a good start to the day. Off to the bus stop where the 61 seemed to be running a timetable of its own devising but one turned up at 07:14 which was fine. Standing room only and obviously people going to work even though it’s a public holiday. Hlavná stanica was buzzing, log queues of happy Bratislavans at the ticket windows. Plenty of time for me to figure out the platform (not difficult, it’s on the electronic equivalent of the yellow sheet) and be there when the stock came in for my pick of shady side facing seats in an air con open second! Haulage was by 362 009. 350 004’s just gone past with a very wedged EC174 Budapest-Hamburg – DB coaches and a MAV buffet car for some reason. 5047 054 of ÖBB has just run in from Gänserndorf. All very cosmopolitan! Very pleasant run out to Trnava apart from the muppet with the mobile, and that was only for a few minutes. They’ve turned this stretch into a very decent railway, smooth and quiet. I’d intended the 09:35 ‘R’ back to Bratislava but cowardice won in the end and when the 09:14 Os turned up lightly loaded in case the ‘R’ was very late (04-something off Košice, so who knows). Noted at Trnava that a large mob of OAPs was waiting for Os2604, 08:45 to Kúty, which left full and standing (3x99 seats and 1x88 so probably over 400 pax). Like yesterday’s, they didn’t have any luggage. Baffling. It’s still a decent railway even in ageing stock, so a pleasant enough run back to Bratislava with an un-noted loco. A period of intensive photting followed, with quite an assortment of locos (and an Austrian dogbox). A beer was procured to tide me over at Bernolákovo in case there isn’t a pub. Naturally, having wimped out of getting R600 back from Trnava, I just made it round to N6 in time to phot it rolling in dead on time at 10:08. The haulage for my 10:45 to Nové Zámky was 240 043. The beer turned out to be a wise precaution – I baled out at Ivanka pri Dunaji on the basis it seemed more important than Bernolákovo (and maybe it is) but there was no sign of any facilities of any sort nearby. The train back to Nové Mesto turned up and duly did the curve round from line 120, which goes off by the old steam depot, way after Vajnory. Tram no 1 then from Nové Mesto to Trnavska mýto and a longish wait for a 61, totally confused by their unpunctuality. Eventually reached BTS at 13:35 still with 90 minutes to go, so no problem. I was particularly impressed with the way we were sent off to board the plane; a very small vestibule with the doors to the outside firmly shut, soon filled up. Unfortunately the escalator was still pouring people in. Drama just averted by opening the doors, but absolutely no marks to Ryanair or BTS, whoever should have been organising it, for a potentially very dangerous situation. No further problems, and we arrived sufficiently early at BHX to get the wretched jingle. From a scheduled 16:35 arrival I managed just to miss the 16:33 from Irrational but caught the 16:38. Both were on time. On to Shifnal with LM, for a lift home from H.
Obviously the loss of the steam trip was disappointing but in the end it was quite a productive weekend with the area around Bratislava completely cleared with the exception of the line down to Rajka and the Hungarian border. The hotel was much better than I’ve found in Slovakia before, so all in all the decision not to chuck away the flight was probably a good one. The pound’s plummeting again (20.9.09) so it looks like I’m grounded now for the foreseeable future. Again. But who knows what 2010 will bring.